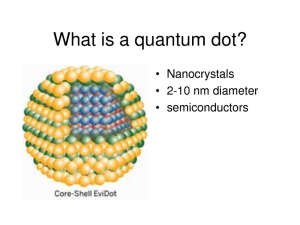 A quantum dot (QD) is a crystal of semiconductor material whose diameter is on the order of several nanometers – a size which results in its free charge carriers experiencing “quantum confinement” in all three spatial dimensions. The electronic properties of quantum dots are intermediate between those of bulk semiconductors and of discrete molecules and closely related to their size and shape. This allows properties such as the band gap, emission color, and absorption spectrum to be highly tuneable, as the size distribution of quantum dots can be controlled during fabrication. For example, the band gap in a quantum dot, which determines the frequency range of emitted light, is inversely related to its size. 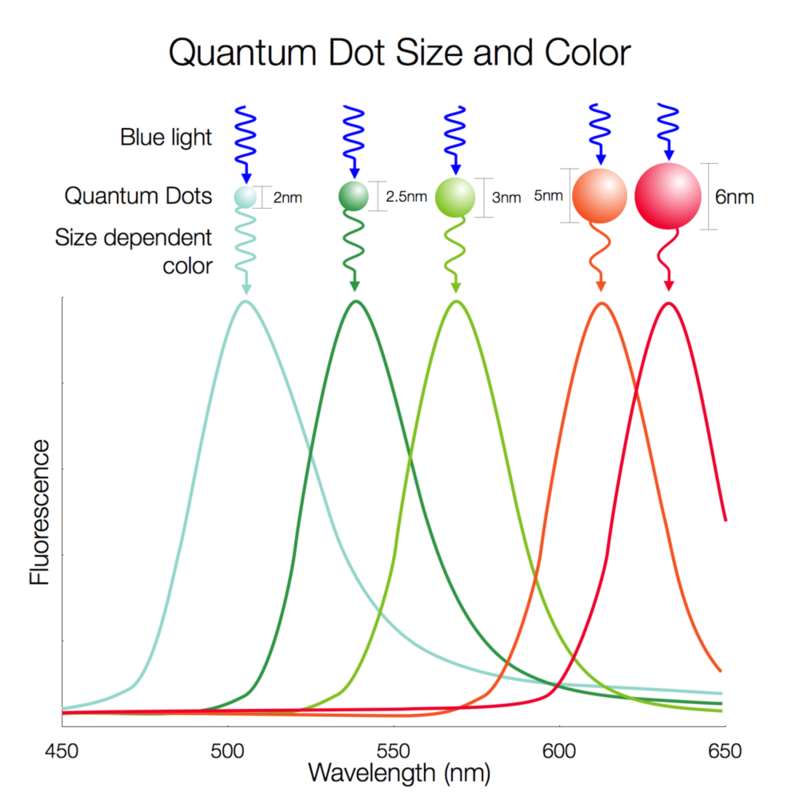 In fluorescent dye applications, the frequency of emitted light increases as the size of the quantum dot decreases, shifting the color of emitted light from red to violet. The small quantum dots, such as nanocrystalline semiconductors in a colloidal solution, have dimensions between 2 and 10 nanometers, corresponding to about 10-50 atoms in diameter, and may reach a total of 100-100000 atoms for each quantum dot . The self-assembled quantum dots have a size of 10-50 nanometers; while those defined by means of electronic lithography have larger sizes around 100 nm. The Quantum Dot which contain electrons can also be compared to atoms: both have discrete energy levels and contain a small number of electrons, but unlike the atoms, the confinement potential of Quantum Dot not necessarily show spherical symmetry. Moreover the electrons do not move in the limited space, but inside the semiconductor crystal that hosts them. Researchers have studied applications for quantum dots in transistors, solar cells, LEDs, and diode lasers. They have also investigated quantum dots as agents for medical imaging and as possible qubits in quantum computing. The small size of quantum dots allows them to be suspended in various solvents and thus compatible with solution processing techniques such as spin coating and inkjet printing. In our experiment we want to measure the fluorescence produced from a colloidal solution of quantum dots, excited by a UV laser at 405nm. In particular we intend to show that the wavelength of the emission is related to the size of the Quantum Dot : the larger the size, the greater the wavelength of the fluorescent radiation. Below are shown the fluorescence spectra of colloidal solutions obtained with a self-built webcam spectrometer using the software Theremino Spectrometer. The emission peak around 405nm is the excitation source. As the confinement energy depends on the quantum dots size, both absorption onset and fluorescence emission can be tuned by changing the size of the quantum dot during its synthesis. The larger the dot, the redder (lower energy) its absorption onset and fluorescence spectrum. Conversely , smaller dots absorb and emit bluer (higher energy) light. Recent articles in Nanotechnology and in other journals have begun to suggest that the shape of the quantum dot may be a factor in the coloration as well, but as yet not enough information is available. Furthermore, it was shown that the lifetime of fluorescence is determined by the size of the quantum dot. Larger dots have more closely spaced energy levels in which the electron-hole pair can be trapped. Therefore, electron-hole pairs in larger dots live longer causing larger dots to show a longer lifetime. To improve fluorescence quantum yield, quantum dots can be made with “shells” of a larger bandgap semiconductor material around them. The improvement is suggested to be due to the reduced access of electron and hole to non-radiative surface recombination pathways in some cases, but also due to reduced auger recombination in others. The problem of quantum mechanics, which corresponds to the ” Particle in a Box ” is a rather difficult thing to display. This is because until now there was not a real good example of such a system. 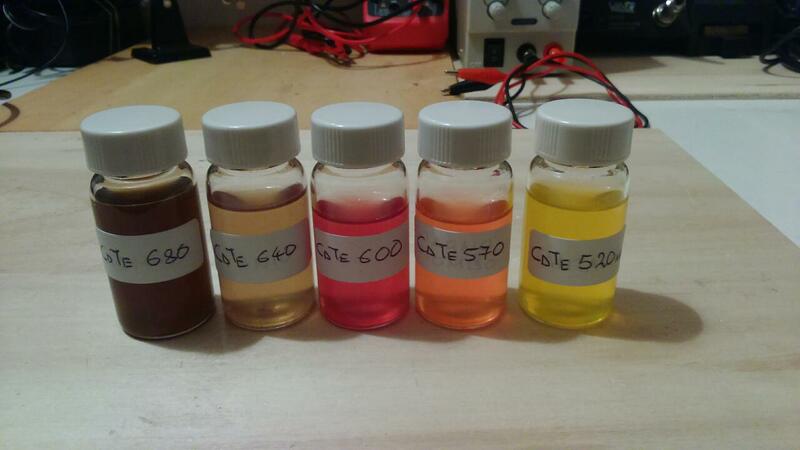 With Quantum Dots the situation has changed. Inside the semiconductor used in microelectronics there are small particles of semiconductors. These may contain an electron and a “hole” (absence of an electron). It is a real world ” Particle in a Box” system : Indeed, the electrons will never go out to the outside of the particle of the semiconductor. 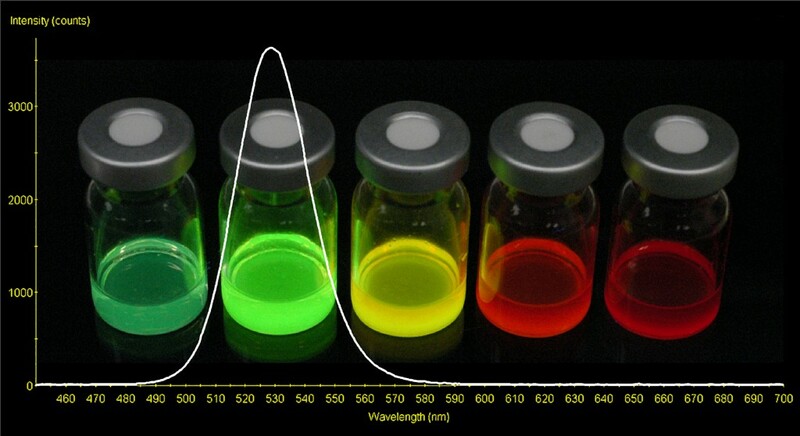 In Quantum Dots the effects of changing the size on the energy levels of the system can be easily viewed. Where L is the length and x is the position within the box. 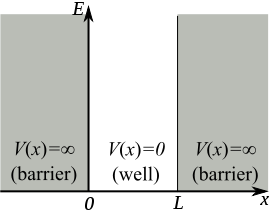 In quantum mechanics, the wavefunction gives the most fundamental description of the behavior of a particle; the measurable properties of the particle (such as its position, momentum and energy) may all be derived from the wavefunction. This problem is not the same as the Quantum Dot since in this last case the box is three-dimensional and spherical in shape. However, the equation of the problem Quantum Dot has a similar expression and is known as the equation of Brus and can be used to describe the emission of energy of Quantum Dot in terms of energy gap of the band Egap, Planck’s constant h, radius of the Quantum Dot r, as well as the effective mass of the electron me* and mh* of the hole. 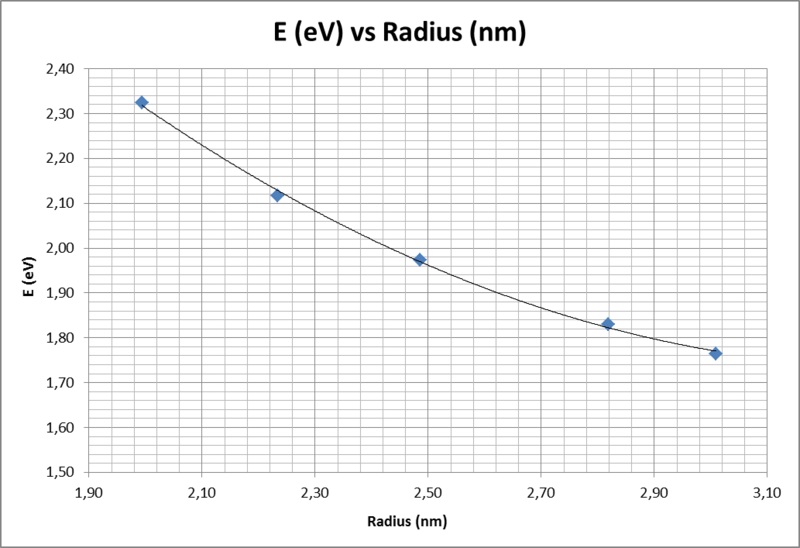 The radius of the Quantum Dot influence the wavelength of the emitted light due to quantum confinement, this equation describes the effect of a change of the radius of the quantum dot on the wavelength λ of the emitted light (and hence on the emission energy E = hc / λ, where c is the speed of light). 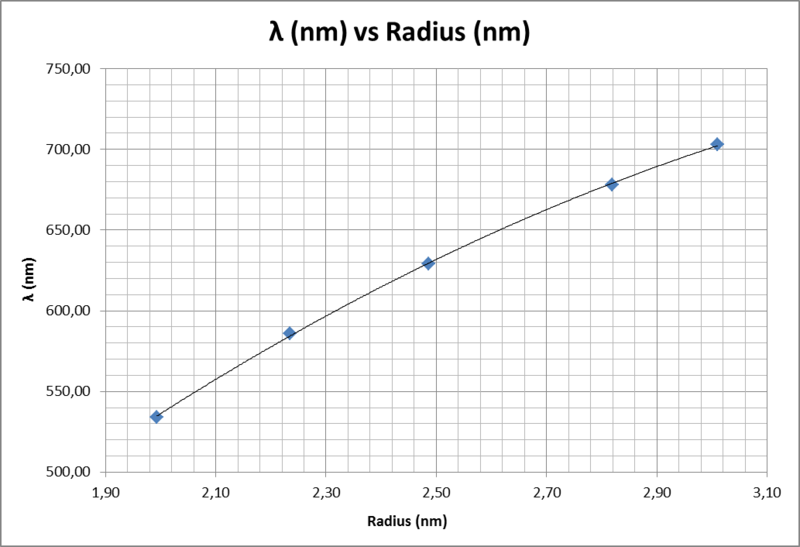 This is useful for calculating the radius of a quantum dot with the parameters experimentally determined. In the above equation, the two m are respectively the effective mass of the electron and the effective mass of the hole, and R is the radius of the quantum dot. 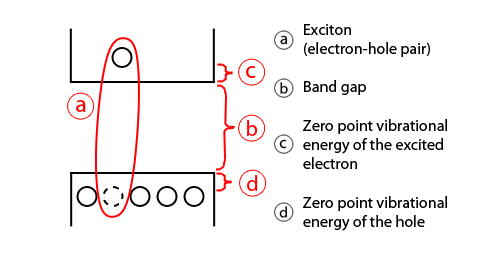 Egap is the energy of the bandgap of the semiconductor. The experimental data are in substantial agreement with the equation of Brus and with the data declared by the manufacturer of Quantum Dot.